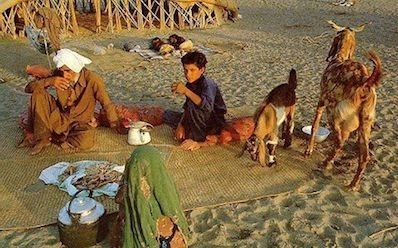 A Baluchi nomad family in eastern Iran. Absolute commitment to kin and cult groups can be seen throughout Middle Eastern history. 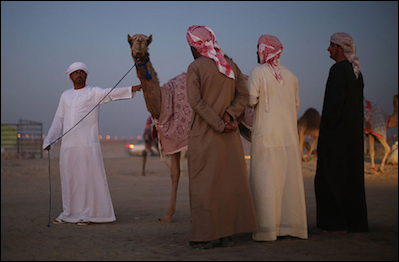 Bedouin men in Abu Dhabi. Relations between descent groups were always oppositional in principle, with tribes as a whole seeing themselves in opposition to other tribes. The main structural relation between groups at the same genealogical and demographic level could be said to be balanced opposition. The strongest political norm among tribesmen was loyalty to, and active support of, one's kin group, small or large. One must always support closer kin against more distant kin. Loyalty was rewarded with honour. Not supporting your kin was dishonourable. The systemic result was often a stand-off, the threat of full scale conflict with another group of the same size and determination acting as deterrence against frivolous adventures. That there were not more conflicts than the many making up tribal history, is due to that deterrence. Honour comes from winning. Losing is regarded as deeply humiliating. Honour is gained in victory. Self-sacrifice in the attempt is lauded, but honour comes from winning. Having lost and being a victim is not an esteemed position in Arab society. Having lost in a political struggle results in loss of honour. This is felt deeply as a loss that should be corrected. Losing is regarded as deeply humiliating. Only the prospects of a future victory and the regaining of honour drives people forward. An example is the Arab-Israel conflict, in the course of which the despised Jews repeatedly defeated the armies of Arab states. This was not so much a material disaster for the Arabs, as it was a cultural one in which honour was lost. The only way to regain honour is to defeat and destroy Israel, the explicit goal of the Palestinians: "from the [Jordan] river to the [Mediterranean] sea." This why no agreement over land or boundaries will bring peace: peace does not restore honour. None of this is unknown to Arab commentators, who repeatedly refer to the tribal nature of their culture and society. Of course, today, few Middle Easterners live in tents and raise camels, but villagers and urbanites share the same tribal assumptions and values. According to the Tunisian intellectual Al-Afif al-Akhdar, the Arabs cherish their "deep-culture of tribal vengefulness" and consequent "fixated, brooding, vengeful mentality." Former Tunisian President Moncef Marzouki has said that "We need an ideological revolution; our tribal mentality has destroyed our society." The tribal nature of Arab societies is deeply embedded in the past, and its roots date back through Arab history to the pre-Islamic era. ... Since Arab societies are tribal in nature, the various forms of monarchies and emirates are the natural continuation of this ingrained social structure in which tribal loyalty comes before all else. The Arabs, even after the arrival of Islam, were never "ideological" people who sought to develop an intellectual vision of ourselves and the outside world. Instead, we are the people of blood relations and family ties, or "Shalal" as we call it in Egypt. ... Despite the fact that Islam was the greatest intellectual revolution in our history, we, as Arabs, have succeeded in adapting Islam to serve the tribe, the family, and the clan. Islamic history began as an intellectual revolution, and as a history of ideas and countries; however, after the beginning of the Orthodox Caliphate, it was transformed into a somewhat tribal state. The State of Islam became the Umayyad State, and after that the Abbasid, the Fatimid, and so on and so forth. This means that we now have a history of tribes instead of a history of ideas. ... Has this tribal history, alongside tribal and family loyalties and the priority of blood relations over intellectual relations gone forever after the "Arab spring?" Of course not; what has happened is that the families and tribes have dressed themselves up in the cloak of revolutions in Yemen and in Libya, and in Egypt the opposition consists of tribes rather than concepts. Middle Easterners are victims of the limitations and shortcomings of their own culture. Many Middle Easterners see the disasters around them, and blame outsiders: "It is the fault of the Jews"; "The British did this to us"; "The Americans are to blame." Many Western academics and commentators say the same, dignifying this counter-historic theory with the label "postcolonialism." But given that tribal dynamics were dominant in the region for a thousand years since the foundation of Islam, and thousands of years before that, blaming outsiders for regional dynamics is hardly credible. Nonetheless, "postcolonialists" will claim that pointing to regional culture as the foundation of regional dynamics is "blaming the victim." We in the West, unlike Middle Easterners, love "victims." But what if Middle Easterners are victims of the limitations and shortcomings of their own culture? Quoted in Barry Rubin, The Long War for Freedom: The Arab Struggle for Democracy in the Middle East, Hoboken, NY: Wiley, 2006, 80-81.